Malaysia was an interesting place to visit, full of variety! Walking a block can feel like entering a different country. This is because there are a few very strong cultures all sharing Malaysia as their home. Only fifty percent of Malaysia’s population is culturally/ethnically “Malay“. Around twenty percent of the rest of the population is of Chinese descent (meaning that someone in their family history came from China not too long ago), and around 7 percent are of Indian descent (meaning that someone in their family history came from India not too long ago). There are also a few different indigenous (the original and native people) groups as well, but the cultures that are most noticeable are Malay, Chinese, and Indian. Each ethnic group has a very different, and very delicious kind of food. Malaysian food is somewhat like Indonesian food with fried rice, or rice topped with grilled meats in peanut sauce. The Indian food available included a flat, pancake-like dish called “roti” filled with egg, or banana, as well as spicy curries. The Chinese food included noodle dishes, vegetable dishes, and fried rices as well. Restaurants stayed open almost all night, so we could see people enjoying their ethnic foods at all times! Obviously food is not the only thing that sets each ethnic group apart. Each ethnic group also brought with it a different religion. Many of the Malays for instance are Muslim. In fact, the country itself will not consider a person truly “Malay” unless that person is Muslim. Still, each person has the right to choose their own religion. Choosing not to be Muslim however, and losing the title of “Malay”, means missing out on a few benefits put in place to boost Malays in Malaysia. As far as clothing, many Muslim women wear full head coverings and dress modestly, usually covering arms and legs. Not all Muslim people in Malaysia practice their faith with this kind of dress, but it is very common. Most of the ethnically Chinese people of Malaysia practice either Buddhism, or folk-religions from China. The ethnically Indian people of Malaysia are mostly Hindu. The women often wear long, dress-like shirts over pants made of the same decorative fabric. There may also be a dot painted in the center of their foreheads. While my husband and I visited the capital city of Malaysia, Kuala Lumpur, we happened to see a Hindu festival, which I believe was the annual Thaipusam Festival, at the Batu Caves. 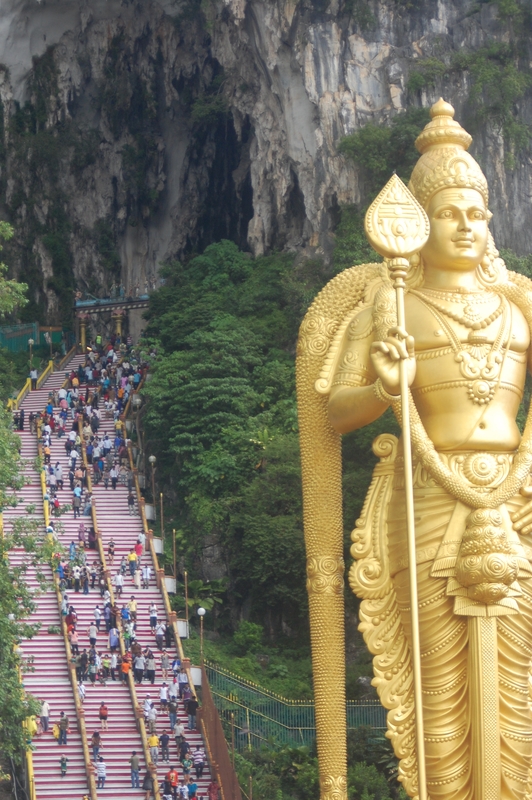 At these caves, there is a giant statue of one of the Hindu gods, Lord Murugan. Inside the caves there are many temples with many other idols. Malaysia offers so much diversity! We got to take a peek at so many different cultures just by going to one place! What kind of diversity do you see within your own classroom? What makes each person different, or diverse? Malay: A person who was born in Malaysia, speaks the Malaysian language, and practices the Muslim faith. Chinese descent: A person who does not live in China, but whose family or family history comes from China. Indian descent: A person who does not live in India, but whose family or family history comes from India. indigenous: A person whose family history comes directly from a place, long before other cultures arrived. roti: A flat type of bread, almost like a crepe or pancake that comes from India and is often filled with egg or banana and dipped in curried sauces. Muslim: A person who believes in and lives their life based on the beliefs of Islam. Buddhism: A faith or thought-system that follows the teachings of Buddha. Hindu: A person who follows the diverse beliefs of Hinduism, including many different gods.